Astragalus is considered one of the most important tonic, adaptogenic herbs. Astragalus has a long history in herbal medicine (including Classical and Traditional Chinese Medicine) and it has undergone significant vetting within modern, scientific medical research. To create a truly unique Astragalus preparation for our customers, Seven Springs Trail Elevated Astragalus begins with a highly concentrated organic Astragalus Extract which been standardized to contain 70% of the active polysaccharides present within the plant. We then fortify that with an isolated Astragaloside IV (5%) Extract. Astragaloside IV is highly researched compound present in very small quantities within the unextracted root and has demonstrated promise for repairing and extending the lengths of chromosomal telomeres. We are confident that with Seven Springs Trail Elevated Astragalus Extract we are able to offer our customers the strongest, highest quality Astragalus Extract possible. View our Seven Springs Trail Elevated Astragalus quick facts PDF. Astragalus Extract (standardized to 5% Astragaloside IV) — 500 mg.
All our packaging is food grade, and the outside and inside pouches of this product are resealable. The opaque color of the outside pouch helps to block UV light and prevent degradation of the product. The artwork on this pouch was produced specifically for—and inspired by—our Seven Springs Trail Astragalus Extract Blend. We package this item (as we do all our items), in a certified organic, FDA cGMP facility right here in the US. View our Seven Springs Trail Astragalus Extract Blend quick facts PDF. Astragalus has been used as an essential tonic (adaptogen) for over 2000 years, first mentioned in the historical Shennong Ben Cao Jing (Divine Farmer’s Materia Medica). Within Traditional Chinese Medicine (TCM), Astragalus (Huang Qi) is one of the 50 fundamental herbs. As with many medicinal plants, the active compounds present in astragalus are the polysaccharides. In astragalus, these are referred to as Astragalus membranaceus polysaccharides (APS). Estimations put the level of polysaccharides in raw, un-extracted astragalus root at 10%. Seven Springs Trail contains a base of astragalus extract that has been standardized to contain 70% polysaccharides. At a 2:1 ratio, we add to that an even more concentrated astragalus extract that has been standardized to contain Astragaloside IV (5%). This is a truly unique product that we developed just for our customers. In the Shennong Ben Cao Jing, Astragalus was rated as a Class One herb, meaning that it was edible with little to no harm on the body. This is different than our modern understanding of toxicity, and as context, many medicinal herbs are considered to have the potential to do harm to the body in Chinese medicine, which is one of the reasons herbs are rarely used alone—other herbs are included in a formula to mitigate the “harm,” (which could be an herb adding Heat or Dampness to the body). Huang Qi, as Astragalus is known in Chinese medicine, translates to the Yellow Senior. Huang Qi is known as the Yellow Senior because the raw root is yellow (thus the name Yellow), and because Astragalus is thought to be the leader of tonics, the elder (thus the name Senior). Used for Wasting and Thirsting syndrome. Historically, Astragalus has been used as a tonic for restoring deficiency, wasting, and exhaustion. However, in the past half-century, much of the scientific literature on Astragalus has focused on its effects upon the immune system as an adjust therapy to chemotherapy, and on its effects upon the cardiovascular system and benefits to cardiovascular diseases. In pharmacological studies, crude extracts of Astragalus, as well as isolated constituents, showed anti-inflammatory, immunostimulant, anti-oxidative, anti-cancer, anti-diabetic, cardioprotective, hepatoprotective, and antiviral activities. Modern phytochemistry and pharmacological experiments have proved that polysaccharide is one of the major active ingredients in the root of A. membranaceus with various important bioactivities, such as immunomodulation, antioxidant, anti-tumor, anti-diabetes, antiviral, hepatoprotection, anti-inflammation, anti-atherosclerosis, hematopoiesis, and neuroprotection. The anti-diabetic potential of Astragalus membranaceus has been progressively studied in the recent past. Its crude extracts have been reported in several ethnopharmacological studies as a potential prospect for further anti-diabetic studies. Recent studies have analyzed its phytochemical constituents in elucidating its pharmacological significance to types 1 and 2 DM. Its polysaccharides, saponins, and flavonoids fractions and several isolated compounds have been studied. They all exhibited differential potentials of correcting the characteristic defects of inadequate insulin production, secretion, and action on target cells. In a research study (2015) aimed to analyze whether or not Astragalus extract has any benefit to improving testosterone levels, researchers tested the effects of it upon Leydig cells (the cells that produce the majority of testosterone in males) taken from rats. Researchers found that with Astragalus extract the number of Leydig cells both increased in number and that treatment with Astragalus extract increased the level of testosterone produced by the cells. In another study, researchers tested the effects of 18 major Chinese herbs for their ability to increase sperm levels (a signal of endocrine health) In Vitro. Of all the herbs, only Astragalus showed a stimulatory effect upon sperm levels in healthy donors. Structural features and biological activities of the polysaccharides from Astragalus membranaceus. 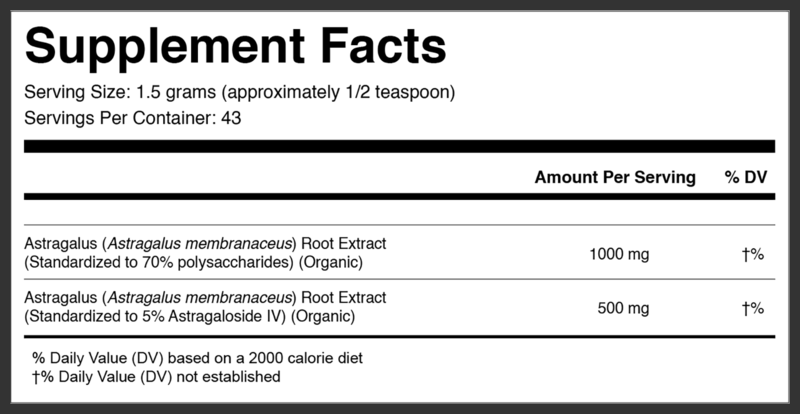 In each 65 gram pouch, there are approximately 43 servings of standardized Elevated Astragalus Extract. Astragalus Extract (standardized to 5% Astragaloside IV). Astragalus has been shown to inhibit the enzyme CYP3A4, an enzyme involved the metabolism of many prescriptions, pharmaceutical drugs. In addition to always speaking with a qualified health care practitioner prior to the use of any medicinal herbs, supplements, and other alternative therapies, for those using pharmaceuticals, consult your prescribing doctor prior to use of this (and all) products. I have been taking Raw Forest Foods Astragalus extract since two months ago, and have seen a wonderful effect. I have more energy, better mental clarity, and improved skin tone. I take about 5 gr of the extract with 1gr of Chitosan to increase biovailibity of Astragalosides. With regard to telomeres lengthening, there are research showing the whole herb extract is more effective than isolated Astragaloside IV, and perhaps even better than super expensive TA-65 tablets sold by TA sciences company (You will have to spend 600$ a month for those!) RAW Forest Foods is the only company I know that offers an extract with an effective dose of Astragloside IV, wonderful product!